Silver Bullet AM™ is an antimicrobial coating that is used on surfaces to help protect them from retaining mold, algae fungi and another virus such as E. coli. This coating system is ideal for areas where severe chemical washing occurs, such as handrails, restrooms, food services, hospitals, HVAC as well as commercial door handles. Silver’s stable ion exchange process represents a significant improvement over standard organic antimicrobials that dissipate rapidly. 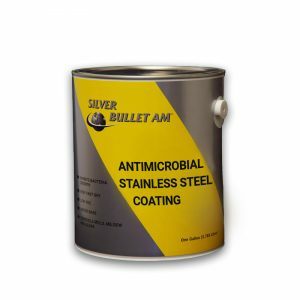 SKU: Silver-Bullet Category: Antimicrobial coatings Tags: Algae resistant paint, antimicrobial paint, Fungi resistant paint, Mold resistant paint Brand: Burke Industrial Coatings. Silver Bullet AM™ with Agion® Technology is a high gloss, high durability water based epoxy that contains a broad spectrum antimicrobial agent. Once applied, it has the ability to protect the coating surface from a broad spectrum of bacteria such as e.coli, salmonella, and listeria as well as fungi such as mold, mildew, and algae. Silver Bullet AM works by disrupting the reproduction and inhibiting metabolism of microbial cells. Silver Bullet AM is for interior applications only. VOC compliant (171g/l or 1.45 # per gallon). Increased emphasis on food safety creates the need for enhanced measures to reduce bacterial presence in the processing arena. To address industry needs for effective protective coatings, Burke Industrial Coatings has developed an ultra high-performance coating system. The product identified as Silver Bullet AM® inhibits the growth of a broad spectrum of bacteria, mold, and fungi in addition to providing long-term protection against severe wash chemicals. Highly durable and corrosion-resistant, Silver Bullet’s active ingredient is its namesake: silver, a safe and natural antimicrobial with proven success in food processing applications. Proven safe for human contact, silver is effective in over 650 strains of bacteria, yeast, fungi, and molds. A highly durable coating, Silver Bullet can be applied to plant equipment, walls, ceilings and other appropriate surfaces to reduce microbiological contamination and propagation. Because it is an inorganic antimicrobial, silver has been able to address many of the issues associated with its organic counterparts that have been developed over the years. These include thermal stability, environmental compatibility, effective life expectancy, and bacterial resistance. Silver inhibits reproduction, interrupts metabolism, and disrupts cell wall functions of many molds, yeasts, and bacteria. Harnessing the power of silver in its ionic form, Silver Bullet’s antimicrobial compound has been proven to provide microbial efficacy within hours, and able to maintain optimal performance for years. A compound of elemental silver, Silver Bullet’s antimicrobial additive uses a zeolite carrier that allows a controlled and effective release of the silver ions. The controlled release of silver and copper ions results in a long-lasting, on- demand, an antimicrobial effect on bacteria and suppresses future contamination. Silver’s stable ion exchange process represents a significant improvement over standard organic antimicrobials that dissipate rapidly. Rigorous laboratory studies subjecting Silver Bullet-coated equipment through intense test conditions prove that the coatings can withstand a wide array of chemical and temperature extremes. Independent tests show that even under severe conditions, Silver Bullet AM® continues to provide a significant reduction in various types of bacteria commonly associated with food spoilage and contamination. Why Burke’s Antimicrobial Paint Coatings? Burke Industrial Coatings has more than 50 years of leadership in industrial coating technology and more than 25 years innovation in manufacturing coatings for the food processing industry. Our ultra-high performance coatings have a track record for long life in severe environments. Required on all metal or old coatings: Remove all dirt, grease, oil, salt and chemical contaminants by washing the surface with BC-4000 cleaner or other suitable cleaners. Thoroughly cured old coatings or new smooth metal may require scuff sanding for maximum adhesion.